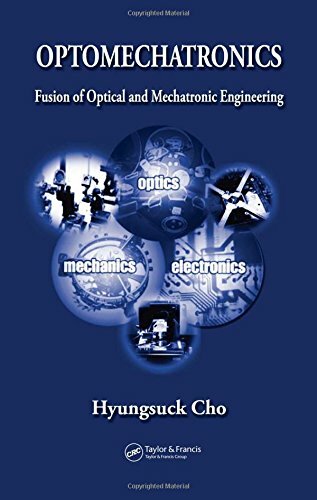 [PDF] Optomechatronics: Fusion of Optical and Mechatronic Engineering (Mechanical and Aerospace Engineering Series) | Free eBooks Download - EBOOKEE! Description: Representing an evolutionary leap, the integration of optical technologies into mechatronic systems adds a new dimension to an already multifaceted field. Optical elements enhance the functionality of mechatronics and in many cases introduce entirely new capabilities. Likewise, mechatronic elements bring the same synergistic effects to optical systems. However, most books focus on traditional mechatronics while only briefly discussing, or omitting completely, the characteristics of optomechatronic technology. Bringing together the fundamentals and underlying concepts, Optomechatronics provides a detailed introduction to this growing field. With emphasis on the importance of interdisciplinary, multiple-technology fusion, this book threads together the background, definition, and characteristics of the field with an integrated view of various disciplines, a system-oriented approach, and a combined view of the macro/micro worlds. It begins with an analysis of a variety of practical optomechatronic systems to identify the underlying concepts and features of each area composing the field. These systems include optics, machine vision, feedback control, and micro-opto-mechanical systems (MOEMS). From this platform, the author demonstrates how to fuse the optical, mechanical, electronic, and microprocessor elements to realize desired functionalities. Finally, the book examines whole optomechatronic systems comprising the components described in the previous section. Whether you are new to the field or have experience in a different engineering discipline, Optomechatronics supplies the necessary tools to harness the benefits that optical technologies bring to this important emerging area. No comments for "[PDF] Optomechatronics: Fusion of Optical and Mechatronic Engineering (Mechanical and Aerospace Engineering Series)".